ATTENTION, this railroad is about to be dis-established, awaiting a rebuild. Grant and Donna are moving house and intend rebuilding as soon as they have settled in there new location. Unfortunately, the website that is hosting this page is also about to be dis-established. This website will only remain active until their ISP decides to overwrite it. 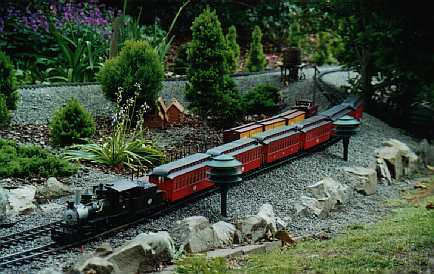 Squirrel Valley Railway is the third Garden railway created by Grant and Donna Alexander. It is an outdoor model railway based loosely on a comfortable amalgamation of turn of the century American and New Zealand Narrow Gauge Railway operating practices. Currently the line is about 330 feet long and is "Stage One, Two and Three" of a grand multi-stage plan are all but complete. Future stages will probably follow over the next few years and will include a zig-zag logging branch, and a seperate "Steam" circuit. We have track-powered trains, Live Steamer's and battery powered equipment running here at "The Valley". This is our 3rd and hopefully final Garden Railway, and its progress will be detailed here at the Squirrel Valley Railway Homepage, more specifically at our History and Progress page's where you will see that it is well under way. In fact the MainLine is all but complete, and many trains have run. Now comes the pleasurable task of gardening around the layout and planning for future stage's. We have also commenced the groundwork for our latest interest, that being a "ride-on" railway with tracks laid to 7&1/4" gauge. Our initial plan for this is a simple 140 yard loop with a few sidings, but eventually we'll have a 510 yard mainline on our 4 acre property. And this is the current state of the new Squirrel Valley Railway. This site first created 12th September 1997.